Thanks to Dorset For Europe for coming up with these fantastic and well researched facts to counter the Brexiter’s myths. Just click on the ‘myth’ and the real story will appear. Most Leave voters don’t like the idea of a 2nd referendum or “People’s Vote”, they say it’s an affront to democracy to even campaign for one. Every clear thinking person can see the immediate problem with this one. How, surely, can having more democracy be undemocratic? It is the very essence of democracy for the people to be able to campaign and argue for whatever they want. Democracy is a continuous process and doesn’t end with any one vote. As Nigel Farage said before the referendum, a 48:52 victory in favour of Remain would be ‘unfinished business’. It’s a bit rich that people like him claim we are undermining democracy. In fact, it’s the Leave campaigns that won the 2016 referendum undemocratically. For a democracy to function, the people must be sufficiently well informed and enabled to make an educated decision. The campaigning and voting process must be free and fair, and subject to a level playing field of rules and regulations governing spending and honesty, among other things. It is now known to a criminal standard of proof that both Vote Leave and Leave.EU broke electoral law, overspending by up to 10%. Both campaigns also broke data protection legislation. Both campaigns have been fined and referred to various police forces for their crimes. Arron Banks is being prosecuted because he can’t explain where his £8m of funding came from. Boris Johnson is being prosecuted for the £350m bus claim. For more on the lies, lawbreaking and hypocrisy of the Leave campaigns visit brexposed.uk. Opinion polls since the 2016 referendum, especially in the last year or so, show increasingly that remain has overtaken Leave, currently (March 2019) by a 10 point lead – that says a lot about where real will of the people is going. The EU was conceived as a peace project in the 1940s following the 2nd world war and has provided stability and growth for its members ever since. Today’s connected world means that countries will collaborate more, and be more connected than ever – this helps in numerous ways, trade being one of them of course, but also it is the only way we’ll combat terrorism, climate change, international crime, etc. Playing a strong part in the EU has been hugely beneficial to the UK, not only financially. We have led the world on climate change and have played a key part in global politics. ‘Survival’ is inward looking – we must work together so that everyone thrives. The EU is the largest and most successful trading block in the world with over 500m people in 28 countries and and economy worth $17 trillion. 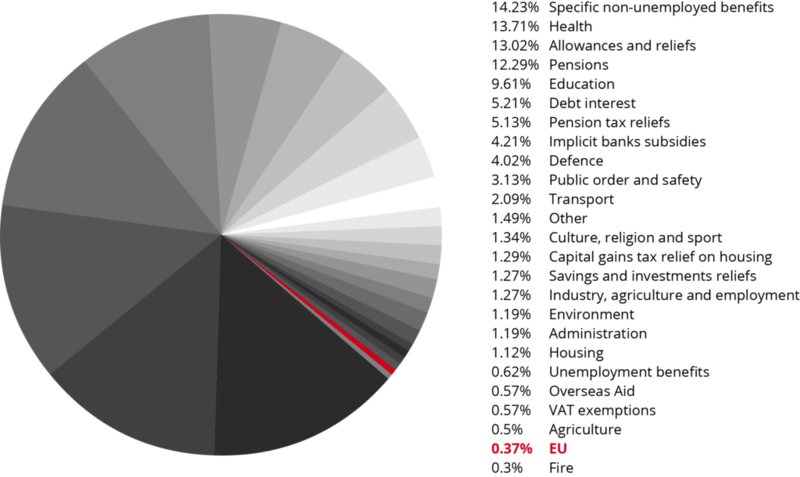 45% of our exports, and 55% of our imports are with the EU 27 alone, with a similar amount traded through countries have trade deals with via the EU . We have trade deals with 67 countries, with negotiations ongoing with a further 22. Our economies are so entwined that leaving is very complicated and time consuming. Sure, we could ‘survive’ without it. But who wants to merely survive? The majority of the country want to be more prosperous and have better access to good quality public services. The EU is the best way of maintaining the income required to provide good public services, while our collaboration on medicines, climate change, crime, etc. means it’s greater efficiencies in many everyday government functions. Leaving the EU means greater UK bureaucracy, higher costs, lower standards. WTO is easy – just walk away! If only it were that simple. The EU’s relationship with the UK runs much deeper than simply trade. WTO rules cover trade only. The ‘Four Freedoms’ of free trade in goods, free trade in services, free movement of money and of people means there are thousands of laws and regulations that we have willingly signed up to that will need to be carefully unpicked to ensure the smooth running of our economy and to ensure that key services can be maintained. For example the laws, regulations and compliance requirements on aviation, international taxation, food standards, medicines, nuclear materials, workers rights, international payments, insurance, and many many more would end over night should we leave the EU with no deal or transition agreement. Not only this, the UK’s treaties with the EU and 3rd countries through the EU would be broken. That means breaking international law and we could find ourselves in the international courts. Some people believe we would not have to pay the EU ‘divorce payment’, however this is not the case. We signed up to certain obligations. There are many ongoing EU projects that we contribute to through our EU membership, we have UK citizens who need to collect pensions, etc. These need to be paid for and are due whether we leave the EU with or without a deal. Leaving the EU without a deal on ‘WTO rules’ would mean we are the only country in the world that operates on WTO terms alone. It is worth remembering that WTO is the fall-back position, the ‘backstop’ that means we can all trade together. It is the worst trading position possible, which is why countries make bilateral trade deals, or form trading blocks like the EU. In reality, on a WTO exit we would be in the worst possible situation. We would be desperate for ANY deal we could get, so would have to give up many of the quality standards we currently take for granted. Trade deals often come with other hidden costs. For example, the USA has insisted that we take their sub standard meat and GM crops, and demands access to our health care system, effectively opening up the NHS to big money interests in the US (the NHS is the largest single drugs market in the world.) India has insisted they get preferential visa-free travel and working rights in the UK. The US has insisted that if we do a deal with them we can’t then do any deals with China. Contrast this mayhem with our current situation. Through the EU we have full free trade in goods and services with 27 countries. We have further free trade agreements with 40 other countries. The EU is currently in active negotiation with a further 22 countries. Of the top 30 countries in the world for GDP the EU has trade agreements, or is in active negotiation with, with 27 of them. Leaving on WTO terms would be a massive mistake, there was no mandate for it via the 2016 referendum (it wasn’t even considered an option). See the charts below: The Red colours show countries either in the EU27 or with agreed and active trade deals, orange colours show trade deals currently in active negotiation. Blue colours show countries where we have either suspended trade deals (notably the USA), or have no trade deals in place (Iran). Pro-Brexit campaigners say even if Britain and the EU fail to agree terms for their divorce, Article 24 of the World Trade Organization’s (WTO) General Agreement on Tariffs and Trade would let them keep trading as now for up to a decade. This is another Leaver Lie. For Article 24 to come into force it would require an agreement on both sides and an agreed time frame to allow this. Because Brexiters insist that leaving on WTO terms means ‘no-deal’ and no ‘divorce payment’ there is no way that there would be sufficient good will for Article 24 to come into play. Although there is a clause in the rules that allows for interim agreements, WTO spokesman Keith Rockwell said it also requires the two sides to provide a plan and reasonable time-frame for their deal to take shape: a distant prospect. “This presupposes, of course, that both the UK and the EU agree on the process of negotiating a deal, whatever form that deal may take. It would also require that both parties agree to an interim deal,” he said. Trade lawyers are exasperated that Article 24 keeps resurfacing, despite their attempts to knock it down. “It’s amazing how this awful misinterpretation of Art XXIV GATT won’t die, no matter how many times I point this out,” Lorand Bartels, reader in international law at the University of Cambridge, tweeted in May last year. “It’s utter nonsense,” former Australian trade negotiator Dmitry Grozoubinsky tweeted in December. It’s unbelievable that this comes up in our conversations on the street stalls. What is it about the British that we can’t let go of the war? A bit of ‘Fawlty Towers’ humour can be enjoyed in the context of post-war British comedy, but 40 years on from Basil Fawlty, and 74 years on from WW2, this view is embarrassingly out of touch and smacks of the very racism and xenophobia we fought against in the war. There is a type of of Brexiter who is motivated not by xenophobia, or empire nostalgia, or buccaneering trade fantasies, but instead by “all them EU rules”. Sadly they can rarely name a single one, the reason being there are hardly any! 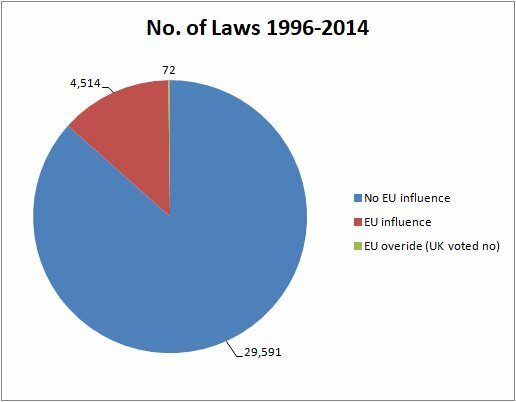 The commons library looked at how many UK laws were influenced by EU laws and found 4,514 out of 34,105. And of those 4,514 only 72 were laws we didn’t vote for. Food labels should say if Aspartame is present. Ban on livestock growth-boosters with hormonal, thyrostatic or beta-agonist effects (carcinogenic residue in meat). Safety advisers dealing with transport of dangerous goods on public roads etc must be properly trained and regulated. Conservation measures to preserve North Atlantic fish stocks. Posted workers must be given the same pay and conditions as local workers. A consistent approach to data collection on goods traded between member states? Tightening up on livestock health checks, paperwork and traceability. Since late 2018 there’s been a cut and paste list of spurious claims about the Lisbon Treaty doing the rounds on social media, apparently it first surfaced on a Russian ‘reddit’ account. It won’t have missed your attention that the official Leave campaigns Leave.EU and Leave Means Leave have not promoted this list, nor has it been the subject of news or TV debate, despite its inflammatory claims. This is because it’s all false. An outright lie. First, notice that there’s no link to the Scary Lisbon Treaty 2020, or quotes from the text. The actual Lisbon treaty was signed in 2007 and came into force in 2009. There have been no major amendments since. It makes no reference to “2020” or “2022”. UK has an opt out from the single currency. Abstentions and vetoes aren’t abolished. As well as the single currency opt out, the UK has opt outs from Schengen, justice and home affairs laws. 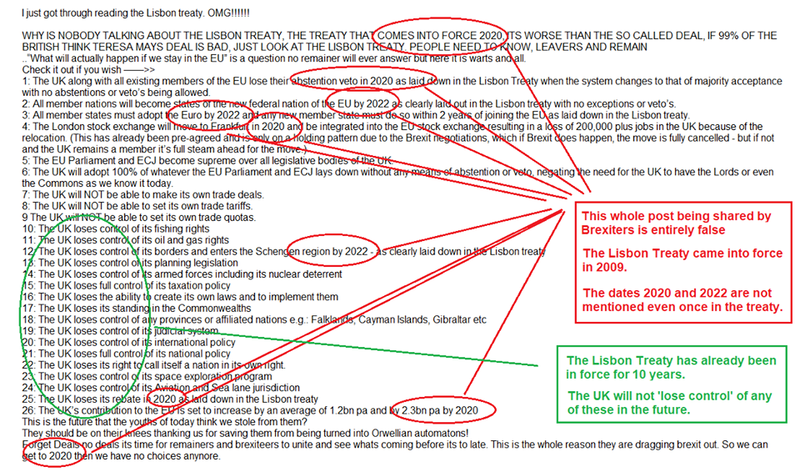 Conclusion: Lisbon 2022 is a leaver lie. We have always had a veto. If we remain in the EU nothing will change from what we previously had. Forced to join a European Army? This one has been going around since before 2016 and was thoroughly refuted even then. Let’s be clear, some EU members are in favour of greater cooperation between various member states’ armed forces. Particularly since Donald Trump has intervened on NATO they have become more vocal. However, any change to the treaties to form an EU army MUST go through a number of processes first. It must be approved by all 28 countries leaders in the EU council. Each country has a veto. We, and others, have consistently said we’d use it to prevent the formation of an EU army. Even if our Prime Minister approved it in the EU council, the UK people would still have to approve it by means of a referendum. So, as you can see, there’s no chance of us being bounced into an EU army. If we did join an EU army it can only be done with the express will of the British people. A series of claims ironically entitled “how good the EU has been for British jobs” has popped up on numerous comment boards and social networking sites, purporting to show that the EU has repeatedly paid companies to leave the UK. The statements, made by various sources in similar terms along these lines, are not true, according to three companies on the online list contacted by InFacts. Dyson, Jaguar Land Rover (JLR) and Marks & Spencer all denied they had received EU funding in the way suggested. This issue should be put in context of European Investment Bank lending in Britain, which was worth around £6 billion last year. EIB loans fund projects like Crossrail and the Midlands Metropolitan Hospital in Birmingham. Notably, the bank lent Ford £450 million in 2010 to develop a new generation of greener vehicles in the UK. That is on top of the £13 billion in EU structural and investment funds that we are due to receive over the current 7-year budget period. In addition, we are the second-largest recipient of EU research funds, which benefit companies like Ford, Marks & Spencer and JLR. In addition, rather than the EU shooing companies away from the UK, our membership of the single market wins us vast sums in investment, both from businesses headquartered on the continent and international firms that want to use the UK as a springboard to access the bloc. Brexit would destroy thousands of jobs that this investment creates. The Institute for Fiscal Studies notes foreign direct investment to the UK is worth an average £54 billion per year. It reckons Brexit would reduce this sum by between 10% and 45%. And, in the run-up to the British referendum, the government’s own published documents spell this out even more clearly. The White Paper of 1971 spoke of “an ever closer union among European peoples”, an objective “to which this country can wholeheartedly subscribe”. It said that “what is proposed is a sharing and enlargement of individual national sovereignties in the general interest”; “Europe united would have the means […] which Europe divided has lost”. No, we haven’t. The UK is not part of the Schengen Zone like most of mainland Europe. So we check everyone who comes through our borders. Freedom of movement of people means anyone from the EU can travel, live and work in the UK. However, they must be able to support themselves. Our government chose not to implement the ‘3 month rule’ whereby we can send home anyone who is either unemployed or can’t support themselves. The UK also chose not to implement the seven-year brake on migration from new EU member states in 2007, unlike many other EU member states. Immigration is a complex issue, and won’t be ‘solved’ by a blunt instrument like Brexit. First off, it’s important to note that the UK is an ageing population and that numbers of younger tax payers are reducing relative to those older people who are taking out increasing amounts in pensions, social- and health-care. The interesting, and perhaps surprising, thing is that EU migration is a net benefit to the UK. In other words, they pay more in tax than they take out in benefits. Part of the reason for this is that EU migrants are young, fit and economically active. Their education was paid in their home country, so they arrive in the UK ready to work and paying taxes. EU citizens pay over £1.18 in tax for every £1 claimed in benefits, opposed to UK nationals who pay 79p in tax for every £1 claimed. EU citizens make up 10% of registered doctors and 4% of registered nurses working in NHS, and many farm labourers and hospitality staff are EU nationals. It is true to say that if you’re in hospital you’re more likely to be treated by an EU migrant than have one in the bed next to you. Since the 2016 referendum, numbers of EU immigrants have fallen, with the consequence that already understaffed hospitals and care homes are losing key doctors and nurses and finding it impossible to fill the gaps. EU migration is the lowest it’s been for some time. But, and some Brexiters might find surprising (and alarming), migration from outside the EU is higher than it has been for for 15 years. The government’s recent Migration Advisory Committee found that there is no impact on wages with workers who are on average pay. There was a very small impact with those on the lowest wages, but this amounts to pennies rather than pounds. The EU is every bit as democratic as the UK, and in some ways more so, but it’s important to see what the differences are. Firstly, it is key to note the EU is not a party-political organisation as we have in the UK. The EU doesn’t vote in one administration, and then vote in another in 5 years time. It doesn’t elect MEPs on a ‘manifesto’ as such, it votes on them to represent our interests and to create and scrutinise laws that affect the EU as a whole. Unlike elections in the UK, elections for MEPs are done on a proportional representation basis. Our UK parliament manages the key things in the UK like defence, taxation, spending, etc. Because most EU laws must be ratified by all member states, it is impossible for any one country’s interests to override the interests of all. This is the supreme political authority, giving impetus and direction to policy-making. The European Council is made up of heads of state and government, all directly democratically elected by their own people (only democracies can join the EU). The European Council also elects the President of the European Commission. The Council of the European Union comprises ministers from member states, different ones according to policy area (e.g. agriculture, environment, transport, etc.). Decisions are made by qualified majority or, in the case of tax, defence and foreign policy, unanimously (Ie. all must agree). MEPs in the European Parliament are directly elected by their member states under a system of proportional representation. They scrutinise laws drafted by the Commission (in a similar committee system used by the House of Commons) as directed by the Council of the EU and then vote to approve or reject them. 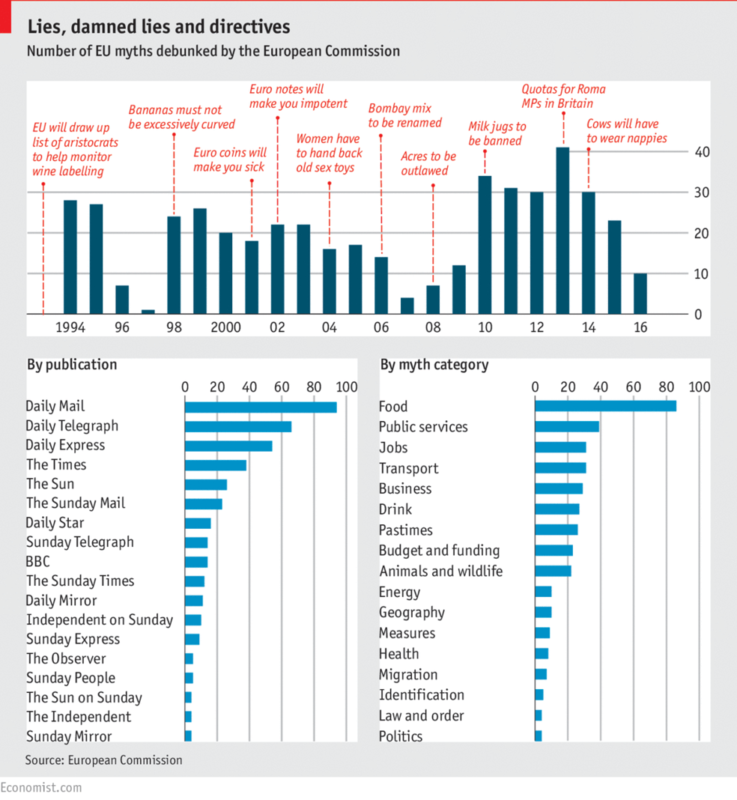 The Commission is the equivalent of the UK’s civil service. Members of the Commission – the Executive body – are nominated by the governments of the member states and selected by the president of the Commission. The composition of the Commission has to be approved by the European Parliament, which also has the power to dismiss it. The role of the Commission is to draft, enforce and monitor the laws, but not to pass them – that is the job of elected MEPs. For the vast majority of laws, consent from both the Council of the EU and the European Parliamentis required before a law may be adopted. National parliaments also have a role. If one third of national parliaments oppose a draft law, this would force a vote in the European Parliament or the Council of the EU. In brief: laws are made by the EU’s directly elected governments and more often than not the European Parliament through the co-decision procedure. The EU isn’t perfect and suffers in particular from low voter turnout but according to the Electoral Reform society, that democratic deficit can be tackled.